In recent months, we have witnessed an uptick of divisive activities on the college campuses where many of you are studying. Some of them are overt and obvious, like the incident at the University of Pennsylvania where Black, first-year students were purposefully included in a series of racist GroupMe texts. On other campuses, the racist, sexist, or xenophobic messages are being subtly delivered through exclusion and stereotyping. I want to take a moment to reflect and to remind you that we live in a country founded on democratic ideals—having a country and government for all people regardless of race, creed, or color. Similarly, the Pullman Foundation has a long history of supporting democracy by supporting the dreams of all scholars, regardless of your ethnicity or gender, or your community or religious beliefs, whatever they may be. As Pullman Scholars, you stand on the shoulders of many who have faced adversity and persevered. When I reflect on what I know of their journeys, I enthusiastically applaud their tenacity. 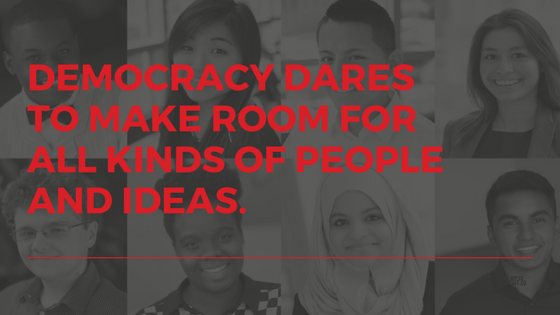 Democracy dares to make room for all kinds of people and ideas. And that is why it is a privilege worth fighting for. 1. Meet and educate yourself about people from different backgrounds. Remember your experience at the annual Pullman Scholar Symposium. At this event, you embrace and learn alongside other scholars who may be immigrants, the children of immigrants, first-generation college students, White, Black/African-American, Multiracial, Asian, Latino/Hispanic, have different major…the list goes on! They may be very different than you, but as members of the Pullman Scholar Community, we all come together to connect, to learn, and to inspire each other. Make an effort to place yourself in situations with many different types of people so that you can learn about them and learn from them. 2. Get informed. In the same way that we encourage you to learn and take advantage of the resources on your campus, we suggest you do the same in your community. Find out who is making decisions that are affecting your life on campus, in your local community, and at the state and national levels. If you are interested in or concerned about a specific issue, research it. Then determine a strategy for conveying your concern to the decision makers. Use your voice to ensure your ability to thrive and prosper. 3. Establish calming habits to avoid anxious days. Technology makes it easy to never disconnect from an unceasing flow of information. And one troubling headline after another makes for living in anxious times. To combat anxiety, establish mechanisms or a routine that will calm you throughout the day. Whether it’s dimming the lights at certain times, drinking tea before bed, or listening to a guided online meditation, develop a practice of self-care that helps you relax and enables you to concentrate on your studies. Lastly, please remember, as a Pullman Scholar you are a part of an amazing community with a long history of inclusiveness. For 67 years, the George M. Pullman Educational Foundation has supported young people with a strong desire to succeed, regardless of their race, gender, or country of origin. This is our legacy and continues to be our mission moving forward.